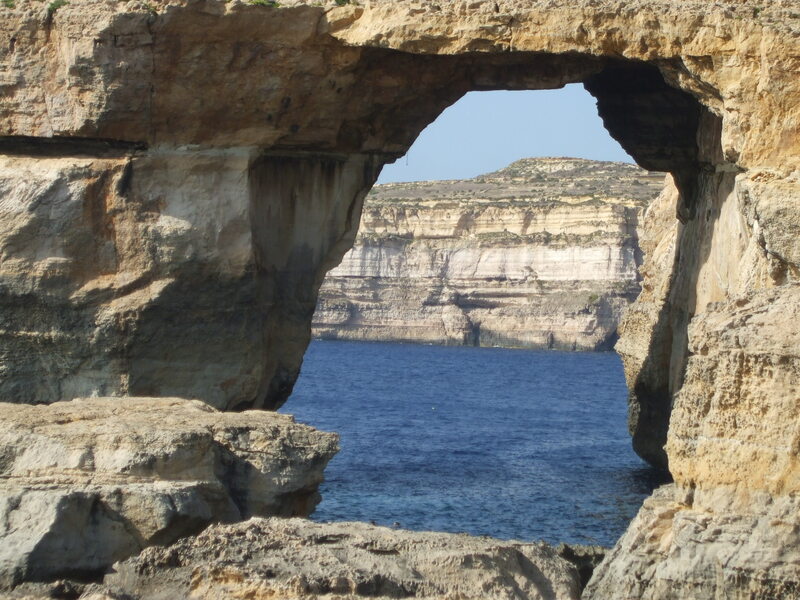 This is a continuation of my post about the Maltese island of Gozo, which we visited on the Wednesday of our week in Malta in early September. 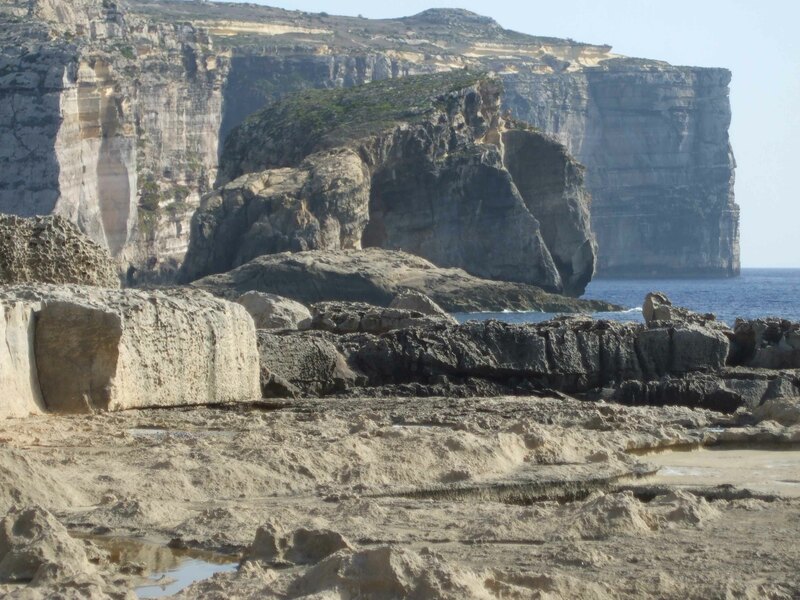 It was a great day out, and we saw a lot of the island, the main site being the Ggantija temples (pronounced like something like J-gan-tia) which my last post on Gozo was about. This time I’m adding a little about some of the other places we visited. So here we go. 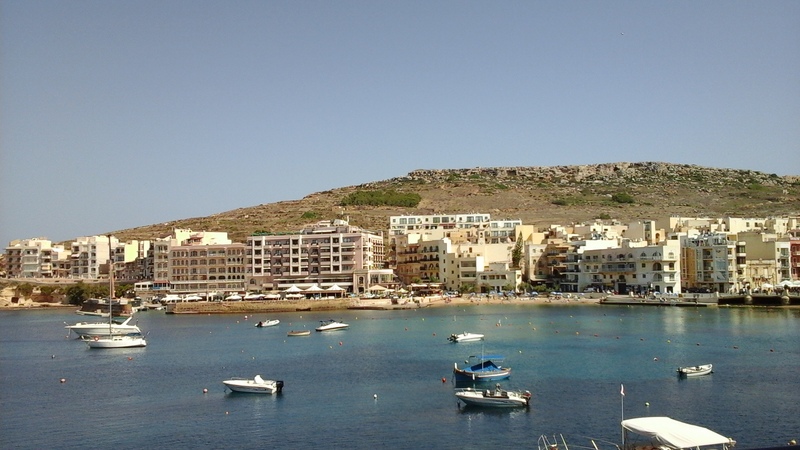 Marsalform itself is the most popular seaside resort on Gozo and is always crowded . . .
We were all handed a nice little bag of sea salt from an old Gozitan stationed along the roadside. The ‘train’ pulled out so quickly that none of us had chance to even offer the old man a tip! I can only hope the tour company pay him for providing this little ‘extra’ service and keeping the customers/tourists happy. 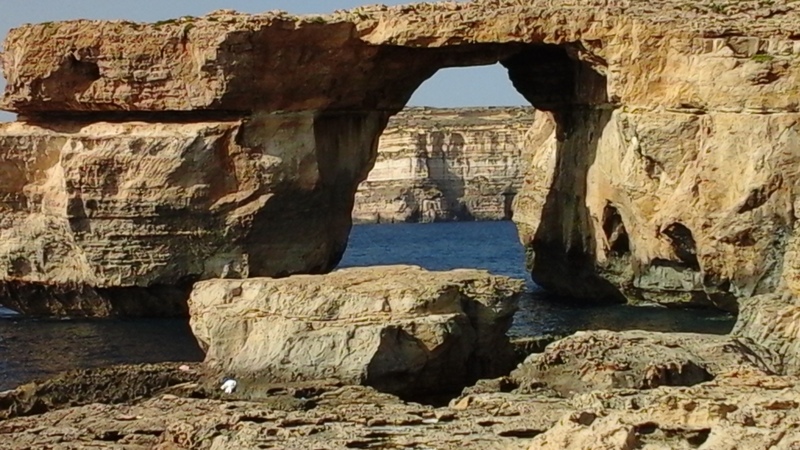 The Azure Window itself was created by the collapse of two limestone sea caves, and is very lovely to see. 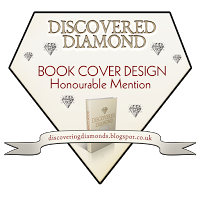 It has been featured in many films, including: Clash of the Titans (1981) the Count of Monte Cristo (2002) The Odessey (1997) – and last but not least, even Game of Thrones! The city’s original name was Rabat, but on Queen Victoria’s Golden Jubilee in 1887, the British government changed it to Victoria. Many Gozitans, however, still call it Rabat, so both names stick together. 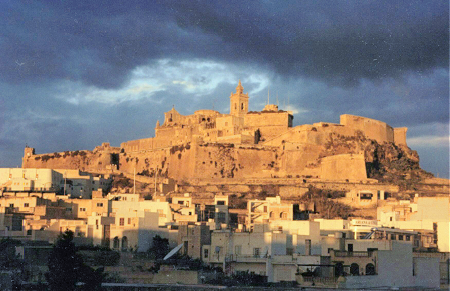 The city is located in the cente of Gozo. At the city’s centre is the Citadel or Citadella (pronounced Chitadella) which has its roots in the late medieval times. But the hill on which Citadella stands has been used since Neolithic times as a sanctuary from attack by Barbary pirates and Saracens. Unfortunately, we weren’t permitted – mayor’s orders! – to enter the Citadella, as building work was going on. (Don’t ask – we didn’t understand that either!) I don’t think we would have had time, anyway, as the tour guide rushed us back to the coach as soon as we’d had our meal of the day at almost 5 pm. We did manage five minutes inside the Basilica of St. George before we had to rush off. The other photos were quick snaps as we walked. There were several plaques and other reminders of St. George along our route. And the door with the key sitting in it was interesting! It seems that burglary is so rare on Gozo that people think nothing of leaving doors unlocked all night, or even leaving the key in the lock for late arrivals. Then it was onto the ferry and back to Malta. I’ve never seen sea salt production like that before (not in person at least), how fascinating! And the water looks so beautiful and blue, that must have washed weeks of stress away just to gaze upon it. It’s so strange to think about the British just renaming the city whatever they wanted to. Such a different mindset. I’m glad for the locals that they maintained their own traditional name. The Mediterranean is a beautiful sea, whichever island – or mainland – you look at it from. We’ve visited many of the Greek islands, too, and never tire of the sheer beauty of it all. The history associated with every single one is just breathtaking. I agree with what you say about the British renaming Rabat. I’ve never approved of conquests of nations, but empire building was what so many nations did in the past – since well before the time of ancient Egypt. Britain itself has been conquered by both Romans and Normans. So I suppose the British, having ‘taken over’ Malta, would have felt at liberty to do as they please. The Maltese are a very wonderful and resilient people. It’s good to see the way they have prospered since WW2 when their islands were bombed to bits. There are many Rabats – there’s one on Malta itself, next to Mdina in the centre of the island. It’s a common Arabic name. Many hot countries produce salt this way. It’s just a case of allowing the sea water to evaporate off. It’s cheap and very effective. I’ll be back to looking at blogs tomorrow. I haven’t done a FFfAW this week …yet. I may not have time, but I’ll get round others. Honest! Thanks for the interesting comment, Joy. So far I’ve only been to Corfu in that area, which was also rich in history and breathtaking. (And also not the original Greek name.) I also haven’t been spending as much time posting or commenting this week, supposedly because I’m so busy at work, although I notice that I just spent a bunch of time learning more about sea salt production and trying to figure out where in Enaena it might make sense. 😉 You always inspire me with these interesting ideas! But okay, back to work…. Corfu is an incredibly beautiful and green island. We last went there in 1998, so time for a revisit, I think. Did you visit the castle in Corfu Town? The whole city is wonderful. All I can remember about the old name is thet it begins with a ‘K’ and has several meanings. I must look it all up to remind myself. Yes, I toured the castle, it was wonderful! And all those adorable winding stepped streets lined with colorful shops and cafes, and churches surprising you around every other corner. But the most uniquely Corfu thing I remember is the kumquat liqueur. I loved it, and brought some home with me. I shared it with all my friends, which I regretted (a little) when I realized I couldn’t buy it here, not anywhere! Later I dated a Greek man for a couple years, and on one of his trips back home he made a special effort to bring me back some “authentic” kumquat liqueur. What a sweetie. I will admit that I was not so generous with that bottle! I envy you your visit to Athens. That’s definitely on our ‘to visit’ list – so much to see there. Lucky you. Do you still have a job that involves travelling? As you say, nice work, if you can get it. Unfortunately no, and yes. My current job requires me to travel, but mostly only to Sacramento. A nice city, but not exactly Athens. Ancient cities are in a league of their own. 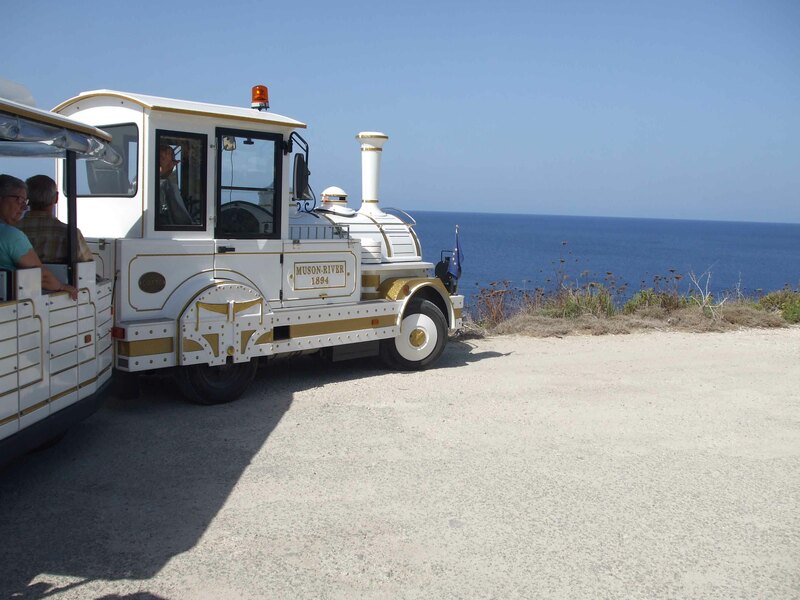 Thanks for the vacation to Gozo, Millie:0)) I enjoyed it. A ride on a reckless train. Good heavens. But you should have asked the salt-bearing old Gozitan geezer about the mysterious circumstances surrounding Caravaggio’s death. A missed opportunity to be sure. When are you going back? Yes, it was rather reckless at 5mph! But the open sides were great for taking photos. He was a strange old man. He sort of appeared and walked quickly along the length of the train as we pulled up and passed several packets of salt through each window. Then, before anyone could get out, the train started moving. He did look rather ancient -and you’re right, he might have known the secret of Caravaggio’s death. Perhaps he helped the artist to flee from possible execution. Perhaps he IS Caravaggio – or is that taking things a bit too far? Oh, it was a bullet train then. I bet they hired Japanese engineers. As for the strange old man (slash Charon slash psychopomp) I really don’t know what to say. Probably just a mendicant. Still, nothing like a five hour interrogation session, after days of sleep deprivation, together with stress positions and strong lights, to make sure he has no valuable information to give. Though this may seem harsh, it’s your right as a tourist. …then the treatment may have been justified. Spoken like a true tourist. Well done, Millie! So much of everything! Maltese lace is exquisite. They are very pretty, aren’t they? Lace making’s an age-old craft with women around the Med. I’ve bought lots of tablecloths in the past, mostly from various Greek Islands. But it looks just the same as Maltese lace. Yes, I’ve seen a lot of lace when we’ve been on the Greek islands. I wonder why lace making has all but died out in the UK? I wonder if it’s because we need warmer woolly stuff? The lace industry in Nottingham used to be one of the best in the world. I think it died out simply because people don’t use it as they used to. At one time lacy cuffs and collars were in great demand – and dressing table covers, tray cloths, tablecothes etc. In places like Malta, tablecloths and such like are still used much more than they are here. Traditional clothes are quite decorative, too. 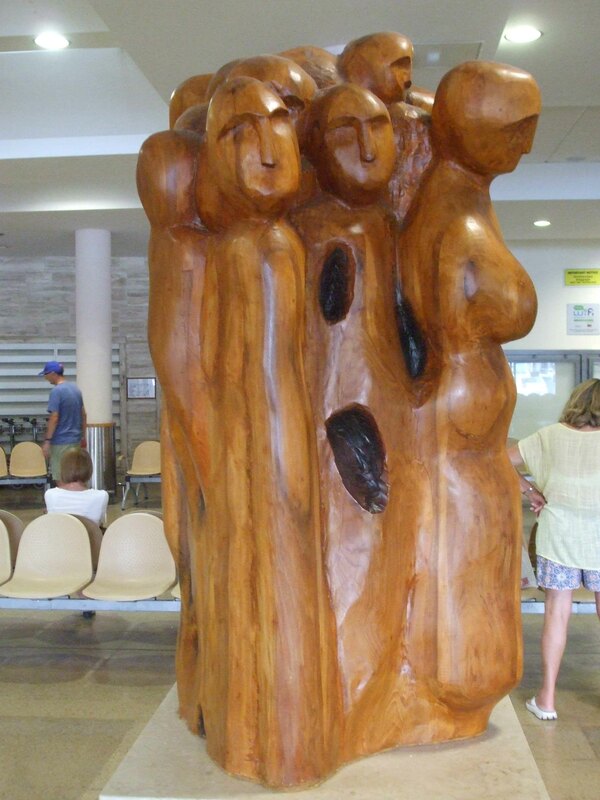 Besides, they know that tourists will buy tons of, just as souvenirs. So I think your guess was a good one – a change in clothing stlye. I am really enjoying this Maltese odyssey! It has filled me with desire to still visit one day and satisfaction that I have an idea of Malta if I don’t even get there. I did not even realise that there were three separate islands that made up the country. Did you buy any of that gorgeous lace? We didn’t buy any lace on this trip, but we have on other visits. I have lots of tablecloths from islands all over the Mediterranean. It’s an age-old tradition with women all round that area. It is lovely, too. A wonderful tradition and one that the women seem to really enjoy! They do seem to enjoy lace making. In the villages, we’ve seen then doing it – although it’s difficult to know how much is staged for tourists to see. ha ha that is awful! I just love the pictures and your wonderful experiences! Quite amazing Millie!